The wall of Fermont protects the town from the climate and is an icon of civic pride. 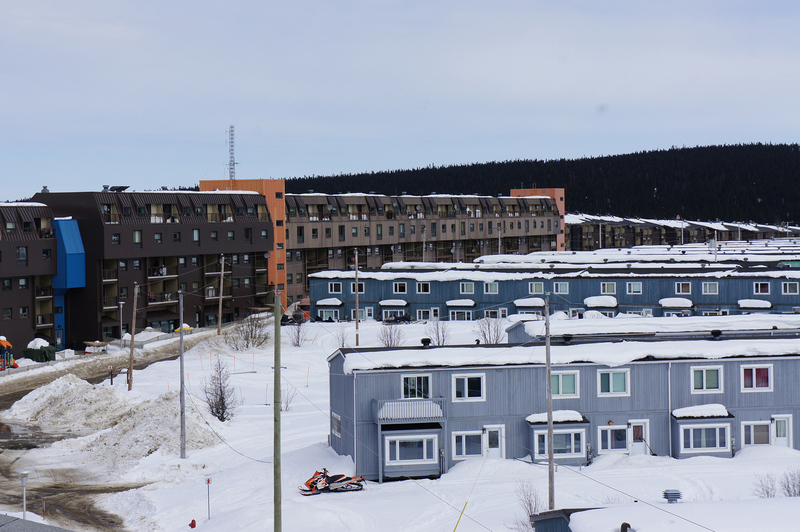 Le Mur-Écran is a 1,3 km long mixed-use building that protects the housing area of Fermont from the winds in northern Quebec on the border to Labrador. The town was planned in 1972 by Norbert Schoenauer to house the workers for the new iron ore mine of Mount Wright. Besides providing a beneficial micro-climate for the central residential district and accommodating several hundred apartments it is also houses the primary services of the city, including shopping centre, hotel, municipal administration, ice rink, swimming pool, kindergarten, police station and school. 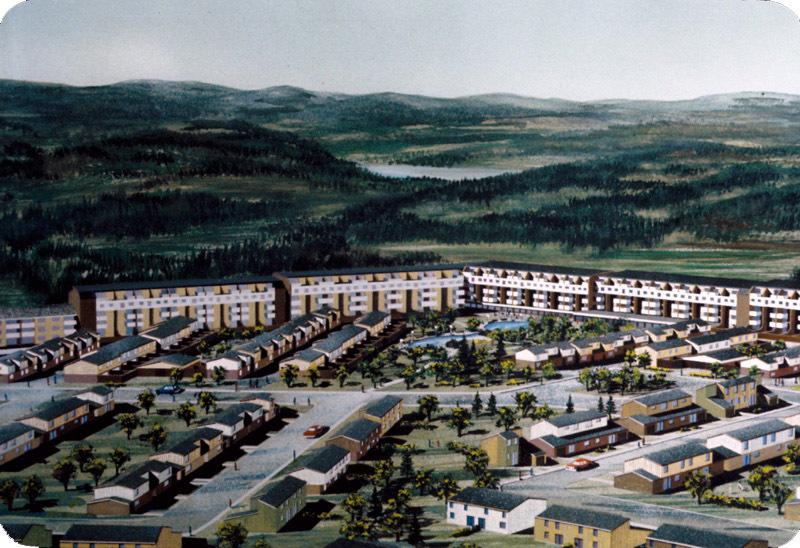 The general layout of the town, including the climate wall and the dense housing area it shelters, is inspired by the works of the British/Swedish architect Ralph Erskine who was also involved in the planning of Fermont as a consultant. He had become recognized as the paradigmatic ‘Arctic architect’, a position he still holds to day among many architects. He designed buildings and urban plans in northern Sweden and Canada and developed a particular architectural language of rounded (aerodynamic) forms and dark colors to catch the heat of the sun. The concept of dense urban clusters protected by climatic structures is most clearly seen in the urban plan for Svappavara in Sweden, but is also found in his proposal for the settlement of Resolute Bay in Canada. Erskine’s architectural thinking was modernist in the sense that the form of the buildings and the urban layout were presented as directly resulting from the functions they were to perform. In Fermont the proposal for the wall was put through extensive wind testing to assure that an improved micro-climate was achieved at the same time as unwanted build up of snow was avoided. While the wall provided entirely indoor public spaces, the purpose of generating an improved local micro-climate was to enhance and reinforce the social use of the outdoor spaces in the town. So in a sense, the climate-determinisitic design of the town had the enhancement of the social aspect of the community as its purpose. The logic of the urban plan dictates that residential areas should to be compact, which also added to the social interaction that Erskine saw as an essential function of a northern urbanity. This social function could, according to him, be achieved through a considering the need for privacy, while at the same time opening up for extended social interaction between the inhabitants enabled by remediating the harsh climate. According to Erskine, the “houses and towns [should] open like flowers to the sun of spring and summer but, also like flowers, turn their backs on the shadows and the cold northern winds”(1), and he argued that only such an architecture would be truly Nordic. During the planning of Fermont, which included consultations with future inhabitants, it became clear that detached houses had to be included in the mix of housing typologies, because residents were adamant that they wanted to live in a city like anywhere else (2). In other words, a contrast existed between the architect’s ambitions of an entirely new urbanism and an architectural language based on an instrumental translation of a particular understanding of how the design of shared social spaces would lead to the creation of community, and the dreams and desires of future inhabitants. In the architect’s pre-construction drawing (3) the residential area and urban spaces of the town is seen from the south, facing the lake and sheltered from the landscape and the northern wind by the climate wall. Interestingly, later representations, including the image on the official website of the city (4) and the welcome sign of the Tourist Information Office of Fermont shows the city from the north – emphasizing the iconic aspect of the wall. The map of the tourist office also deviates from a conventional map orientation by placing the wall at the bottom of the page—between the map-reader and the city. Indeed, it is the only building shown on the map. This orientation reflects the northern entry to the town, where the wall is visually dominating, but it’s iconic appearance also seems captures the pride of the locals of living in community that is in many ways different from other northern mining communities, such as the nearby low density sprawling Labrador City. The vision of Ralph Erskine was that the design of communal spaces, (both in the form of indoor areas as well as climatically remediated outdoor spaces), would make the city livable and attractive, and also be an entirely new urban form that would become indigenous to the North. In Fermont however, the identity of the community seems to be expressed in the iconicity of the wall itself. Even if the architecture and urban spaces of the wall is slightly jaded or tired, it’s shear scale approaches that of the surrounding landscape as well as the mining pits and the gigantic machines that form them.